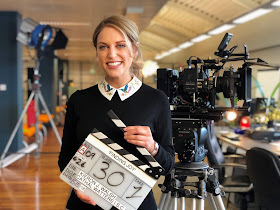 Acorn Media Enterprises (AME) has partnered with RTÉ and Treasure Entertainment, as the North American co-producer of new comedy Finding Joy, created, written and starring Irish Film & TV Academy winner Amy Huberman (Striking Out, The Clinic). The six-part comedy series, which is produced by Rob Walpole and Rebecca O’Flanagan of Treasure Entertainment and directed by Kieron J Walsh, begins shooting in Dublin this month and follows a single woman, Joy, after a painful breakup who looks for happiness in all the wrong places. Acorn Media Enterprises has secured all rights in North America, Australia, New Zealand and United Kingdom and secondary rights in Ireland. RLJ Entertainment’s international division, Acorn Media International, will distribute the series in the English-speaking territories. Following RTÉ’s premiere, Finding Joy will make its North American Premiere as an Acorn TV Original on Acorn TV, North America’s most popular streaming service for British and international television, in Fall/Winter 2018. Acorn Media Enterprises (AME) is the UK-based development division for the Acorn TV brand of RLJ Entertainment, Inc. (NASDAQ: RLJE). As our virtual lives expand to compete with reality, it often feels like everyone else has found the key to happiness in a way that eludes some thirty somethings, leading to a perfect storm of existential torture. Finding Joy explores the many amusing ways we seek happiness and fulfillment in these modern digital times by following 34-year-old Joy (Huberman), who is just trying to get on with her life after a recent break up from her long-term boyfriend, Aidan. While she is struggling to keep up a cheerful and “in control” veneer, the cracks are starting to show with those close to her worried that she is not coping. Meanwhile, her low-key job as copy editor for a lifestyle site is uprooted as she takes over their lead lifestyle vlog, which forces Joy to try a wide variety of activities that purport to be access points to happiness and personal fulfillment. And while her style is far from slick, her vulnerability and naive reporting style strike an honest note with her audience and Joy finds herself breaking out of her safe world in a way she never dreamed possible. Finding Joy is a warm, irreverent show with a lot of heart and laughs as Joy struggles with life, her friends and her world. "Amy is naturally a very funny person, and in Finding Joy she brings that comedy gene to the fore. Her writing is sharp, witty and smart, and in this six part series she has created engaging relatable characters that will go down very well with the audience. Once again it is our key objective to support and develop Irish talent on and off screen, and with Treasure Films producing it promises to a cracker of a series. We are absolutely thrilled to be bringing Amy's comic voice, not just to the Irish screen, but also internationally with our US production partners Acorn TV." Finding Joy also stars Aisling Bea (The Fall, Hard Sun), Lochlann O’Mearain (Outlander), Jennifer Rainsford, Catherine Walker (Acceptable Risk, Versailles), Paul Reid (Vikings), Hannah Scott and Mark Doherty.